Our recent post about the value of blogging lead to a discussion in the comments about ways to organise to do lists and I thought I'd share mine. My Gmail inbox and calendar are where I organise my life. I find that around half of the things I have to do come to me via email, so for the other half, I simply send an email to myself so those things are also captured in my inbox. I use Google Calendar for to dos that are time based, eg. I have to do something at a particular time or on a date in 2 weeks time. As you might just be able to make out in the screenshot below, I use the 'Superstars' gmail labs features. Red stars are important/urgent to do's, blue stars are less important/not urgent to do's and yellow exclamation marks are things I'm waiting to hear back from someone else about - this reminds me to follow up if people haven't gotten back to me about something important. Anything that can be done in under 3 minutes I do immediately rather than emailing myself or starring it. I also use the 'Multiple Inboxes' labs feature so that my starred items, or my to do list appear on the right side of my inbox for easy reference. I don't archive messages which I know is a little abnormal. 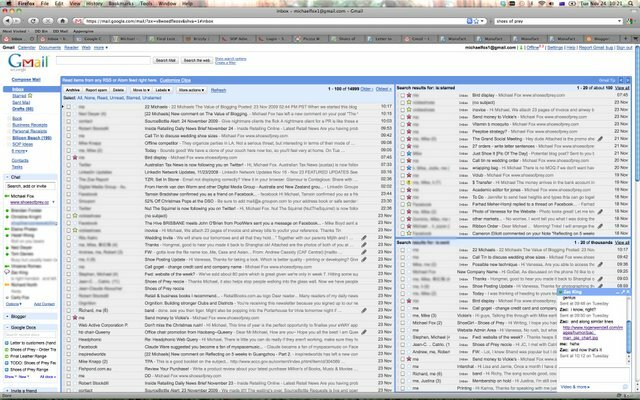 If something is read and not starred it's the equivalent of being archived in my mind, but I like to keep it in my inbox in case I need to quickly scan and find an email that I hadn't needed to star earlier (though I love and often use Gmail search for this). This approach came about after reading The 7 Habits of Highly Effective People a few years ago, then doing a Getting Things Done course at Google and speaking to another Googler, Will Blott who uses a system very similar to the one I now use. While this approach works very well for me, everyone's different and I love hearing about other people's to do systems as I often pinch little things to make my own process more efficient. How do you manage your to dos? Mikes: Great post, thanks for the ideas! Heading over to Gmail now to get my self/biz organized! Why do you have so many things-to-do? Are you the kind of person that starts one thing, not finishes it and picks up on something else? Getting things done is under-rated-love this. Aura - Agreed, it's good stuff, your day can be so much more efficient if you 'get things done' in an organised way. I didn't know about the Multiple inboxes feature. Thanks for sharing that!